How do you stay healthy when you are dealing with trauma and heart breaking stories all day? I am asked this question frequently. The short answer: I am doing what I am passionate about and what I think matters. However, the long answer is that I work at it. Ken Wilber wrote a book called Integral Life Practice: A 21st-Century Blueprint for Physical Health, Emotional Balance, Mental Clarity, and Spiritual Awakening that suggested the need for having a spiritual, emotional, physical and cognitive practice to maintain balance and growth. I have been doing that for years. I am a regular runner, which helps with releasing stress, frustration and keeps me physically and mentally fit. I meditate which is important to help me grow spiritually and keeps me from over identifying with my small self. I am constantly taking courses and reading which keeps me mentally sharp and I practice Focusing weekly to help me stay healthy emotionally. When I am overwhelmed by the system, the world, or my clients I have a partner who is willing to listen to me and I have a wonderful two year old Granddaughter to play with when I want to feel better about humanity. I have to be diligent to not hold on to the sadness and pain that is involved in my work. I struggle with feeling that things are not getting better in the world for women and children so I watch what I listen to outside of work hours. I can’t listen to the news, watch discouraging movies and/or go out with people to complain about the state of the world. This is not putting my head in the sand, I just need to be careful to balance what I see, hear and read so that I don’t become discouraged. One of the art activities that we have been doing in the studio lately is mask making. 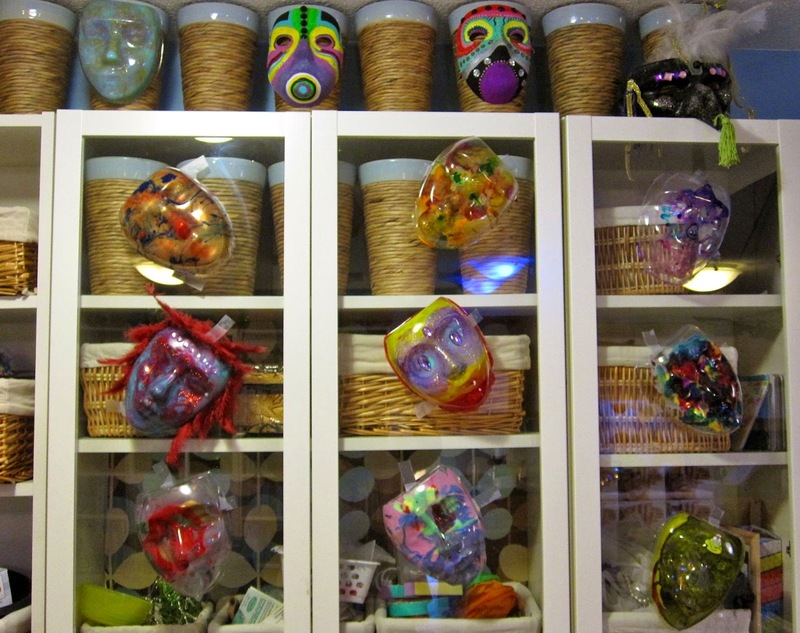 Children learn about identity and self expression when they engage in making a mask. They express feelings through their art, develop critical-thinking skills, and learn that there is more then one right answer or way of creating something. Art making builds confidence and helps children feel happy. I am currently staying home with my infant son after 7 years in the field. This decision was a conscious choice in the direction of self-care among other things. I wanted time to focus on hearth and home after years of being on call and swimming upstream towards self-care. I want to spend as much time as possible with my amazing son, devoting my energy, heart and creativity to this new being. Watching him grow has reaffirmed my hope in and love for humanity. I also continue to make art regularly as I have throughout my career as an art therapist. Exercise and mindfulness have been crucial. And spending time with my husband and friends has always been key in self-care for me. Thanks for your comment Jessi. Love to your son!